This is the second part of our interview with Foti Benlisoy on the history of the Turkish Left from its late-Ottoman beginnings to the present day. As Benlisoy explained in Part I, the era between the coup of 1960 and that of 1980 was something of a high point for the labor movement and socialist political parties in Turkey, marked by high union density and a professional class heavily committed to left-wing, anti-imperialist and developmental-nationalist ideologies. As in many other countries, the 1980’s were a decade of bourgeois retrenchment under the banner of a neoliberal turn backed by the forces of armed repression, in Turkey’s case the military takeover of September 12, 1980. In what follows, we ask Foti Benlisoy to elaborate on the numerous challenges that faced the Left in that era culminating in a second shock to the institutional socialist movement: the collapse of the USSR. Finally, Benlisoy outlines current prospects with an emphasis on the Gezi movement and the ongoing struggles around Kurdish aspirations. Did perestroika and the end of the Soviet bloc seriously affect the Turkish left, or was it by that point fairly isolated from these processes in the Soviet bloc and mainly reacting to the aftermath of the 1980 coup? What dividing lines and debates characterized the Turkish left in the 1990s and 2000s? The dissolution of the USSR was of course a shock for the radical left in Turkey. But it did not lead to a defeat or decomposition by itself. It only accelerated the negative results of previous setbacks. On the one hand, there was the political and organizational defeat that was the result of the brutal military coup of 1980. On the other hand, there was the ideological defeat inflicted by the early neoliberalism of Turgut Özal. It was mainly the economic and social policies of the latter that totally reversed the pro-left political and cultural atmosphere of the previous two decades. The story is similar to other societies that went through early neoliberalism. What Özal did was to decompose and weaken the working class and depoliticize class politics by a mixture of neoliberal technocracy and right-wing populism. “Özalism” was crucial in reshaping the social fabric of the left. As a matter of fact the Turkish left had never been really rooted in the working class. Even during the 60’s and 70’s the main pool of recruiting cadres for the left was, what we can call in Poulantzas’ terms, “the new petty bourgeoisie”, that is students, teachers, lawyers, doctors, engineers etc. Özal’s neoliberalism, by opening new career paths to this strata and by expressing an appetite for market opportunities, played a crucial role in transforming this “public-minded intelligentsia” into market oriented professional middle classes. Thus the marginalization of the working class as a social and political subject and the ideological transformation of the “intelligentsia” during those years socially isolated and politically incapacitated the left. This was the “legacy” of Özalism for the Turkish radical left. During the next decades the major issues for the left were the rise of political Islam and the growth and massification of the Kurdish movement. These two popular movements dominated the political arena from the second half of the 1990s and the left sought to adapt to this new political climate. Political Islam managed to fill the void of the left, and to a certain extent, to mobilize the subaltern classes through a discourse of anti-Kemalist populism. The Kurdish movement, on the other hand, became a massive political phenomenon and that created enormous pressure on the nationalistic character of the Turkish state. In fact the Kurdish left was an offspring of the wider ferment within the Turkish left. It was in the 70s that Kurdish leftist organizations started to claim an independent political program and strategy from the Turkish left and to express their right to organizational autonomy. From the early 1980s the PKK dominated the political geography of the Kurdish left. Its Maoist inspired strategy of protracted people’s war and of creating liberated zones for the eventual independence of a Kurdistan gained momentum from the second half of the 1980s. However, during the 2000s those two movements evolved: Erdoğan’s AKP was a “milder” version of Turkish political Islam that embraced neoliberalism and the dictums of the international order. After the economic crisis of 2001 that led to the collapse of center right parties, the AKP dominated the political spectrum. The Kurdish movement, especially after important military setbacks during the early 90s and the arrest of Öcalan, gradually metamorphosed from a classical “revolutionary” national liberation movement to a broad democratic left movement with a strong emphasis on feminist and ecological perspective. The enormous success of the legal political parties that were linked to the broader Kurdish movement (HDP and its predecessors of the 2000s and 1990s) played a crucial and sometimes contradictory role in this transformation. On the one hand, these parties became the main vehicle where many segments of Kurdish society were politicized and mobilized. On the other hand, these political parties guaranteed a certain participation in the institutions of the Turkish state and thus became mechanisms for the moderation of the movement’s political discourse and strategy. These developments further fragmented and confused the remnants of the Turkish left. The rise of political Islam and the rule of AKP led to a confrontation between left liberals who saw an opportunity for democratization in the European orientation of AKP in its early years in power and those who adopted an anti-AKP stance from a rather pro-Kemalist and sovereignist approach. This polarization had devastating results for the left. The rise of the Kurdish movement opened new spaces for the left in general. But the question of how to relate with the Kurdish movement was a challenge as well. The organizations of the Turkish left faced the risk of being crashed between the Scylla of loosing organizational and strategic autonomy in the face of the now massive Kurdish movement and becoming mere satellites of it and the Charybdis of adopting a rather nationalist approach (of course couched in an anti-imperialist and/or pro-Kemalist political lexicon) against the Kurdish movement. In the absence of an alternative on the left, Erdoğan’s authoritarian populism succesfully channeled the social resentment created by the economic crisis of 2001. This populism shaped the political arena by investing in the imagined cultural divide between a “non-national,” elitist establishment that supposedly despises “authentic” national values, and the pious nation. Despite being in power, AKP could argue that it was fighting against the elitist tutelage of the bureaucracy and military that hampered Turkey’s progress and democracy. In this way, AKP managed to spread its hegemony over wider masses and co-opt potentially dissident elements. While obliging the wider masses to choose sides in the supposed struggle between the so-called “Jacobin-Kemalist elite” and “the god-fearing nation,” AKP debilitated the working class and depoliticized class antagonisms by hiding them under this culturalist veil. Unfortunately, instead of seeking to open a third front based on popular demands of workers, women and all the oppressed and thus seeking to empower popular classes, the left in general opted for becoming a part of these “culture wars” of AKP. Thus, by losing its class base, the left almost ceased being a meaningful referance point in the political landscape of Turkey. This means that during especially the 2000’s the left increasingly faced the risk of becoming a mere satellite of other political forces (liberals, republicans etc.) at almost every political turning point. And now onto the most difficult topic—the left today. The Gezi protests of 2013 were a moment of immense upsurge for the left. However, under massive state repression in the last couple of years, the left seems to have been diminished as an active force. There simply seem few legal strategies left open. Do you see ways out of the stupor in which the left has found itself today? What is there to do except witness the increasing oppression to which the AKP regime subjects the Turkish left and Turkish society? Are there any forms of solidarity leftists outside of Turkey can meaningfully engage in? Clara Zetkin wrote in 1923 that Italian fascism was “a punishment of the proletariat for failing to carry on the revolution that began in Russia.” If you know Italian history, you will remember that fascism was triumphant only after and because of the failure of biennio rosso, which was a period of intense conflict. In the same sense, one can say that Erdoğanist Bonapartism is a punishment of the social struggles in Turkey for failing to carry on the uprising in Gezi. Originating in a struggle over the commercialization of public space — not directly a class-based movement, but nevertheless linked to the class struggles — the Gezi uprising and the social and political radicalization that it caused destabilized the previous power bloc. A rally on the third anniversary of the Gezi protests, May 31, 2016. Source: Euronews. The Gezi uprising breached the imaginary boundary between two “camps” — or “neighborhoods,” as the contemporary Turkish political idiom describes them. Gezi drew its strength from an anti-authoritarian impulse that soared beyond the cultural conflict between so-called secular and Islamic ways of life, which the ruling party’s conservative populism had skillfully manipulated for years to render class-based and social antagonisms invisible. What made the government — and more specifically Erdoğan —panic was its inability to portray the protest as a continuation of Kemalist secularists’ previous Republican mobilizations. It was unable to explain Gezi away with its preferred political and cultural antagonisms. That is precisely why, in June 2013, Erdoğan accused protesters of insulting and attacking women wearing headscarves in Kabataş, or getting drunk inside a mosque. He portrayed himself as preventing the uprising from contaminating the pious nation, of which he claimed to be the true representative. Erdoğan succeeded. He reinforced his hold over his constituency and prevented any splits; he confined Gezi’s influence to a specific cultural, and of course geographic, location. Isolated, Gezi smashed itself against the government’s barriers. Thus after the insurrection the left could not resist a policy of “lesser-evilism” (“anybody but Erdoğan”) and an anti-Erdoğanism without clear social or class content. Thus, the radical potentialities of Gezi were channeled through electoralism and were stuck in the confines of the mainstream republican-liberal opposition. Therefore, Gezi did not have the breadth to create a new social bloc, a new hegemonic project that relies on the political energy of the subaltern classes. In times of intense crisis, the political center rapidly swings between left and right like a pendulum. Thus, on the one hand, it was Gezi that led to a crisis in the previous ruling bloc and destabilized the political centre but on the other hand its failure led to a radical right-wing reaction. Despite the massive and militant character of Gezi and the struggles that it provoked, they were in general unable to change the balance of forces between capital and labor. That means that these massive struggles did not provoke a radical shift in the balance of forces that is favourable to the oppressed. So (since we just celebrated the centenary of the Russian revolution), like every February without an October, our failures led to a certain “Kornilovism” in the face of Erdoğan. A Brief History of the Turkish Left, Par ..
‘Pure’ democracy against the extreme .. Comparative detention: September 12, 1980 and July 15, 2016, in the aftermath of the failed coup attempt. Source: Cumhuriyet newspaper. Erdoğan’s Bonapartism is rising upon the political ruins of the capitalist and working classes who are both unable at the moment to claim the political, social and moral leadership of Turkish society. On the one hand, the ruling class is unable to maintain its unity through parliamentary means. It has lost its capacity of exerting a stable and continous hegemony over the ruled. That is why it chooses to kneel down before Erdoğan “who claims the state as his private property” (Marx) and prefers to maintain its social and economic power by relinquishing its autonomous political power. The capitalist class opts for political nullity, since, in the words of Marx, “in order to save its purse, it must forfeit the crown, and the sword that is to safeguard it must at the same time be hung over its own head as a sword of Damocles.” The working class on the other hand, is incapacitated, fragmented and disorganized through years of neoliberal “reforms” and authoritarian policies. There are plenty of social struggles going on, but these do not possess for the moment the political, organizational and programmatic means to form the basis for a counter-hegemonic project. Thus, this specific conjuncture in the class struggle, which is characterized by the political exhaustion and incapacity of the main social classes, guarantees the continuity of Erdoğan’s Bonapartism. Therefore, the Bonapartist regime can be defeated only by changing this peculiar balance of class forces in favor of the popular classes. In that respect, I think that flanking maneuvers that target the neoliberal, misogynist, and nationalist policies of the government can create the conditions that will enable the social movements and the left to recover and regroup. For that reason, united front tactics at the level of social struggles (and not only at the electoral level) are crucial. The political balance of power that has led us to increasing authoritarianism can only be altered by changing the existing social-class balance of power in favor of the workers. For that reason, we need to combine democratic rights with social and economic demands and to insist on maintaining the radical left’s political independence and strategic autonomy while pushing for broad and open campaigns for the defense of democracy. 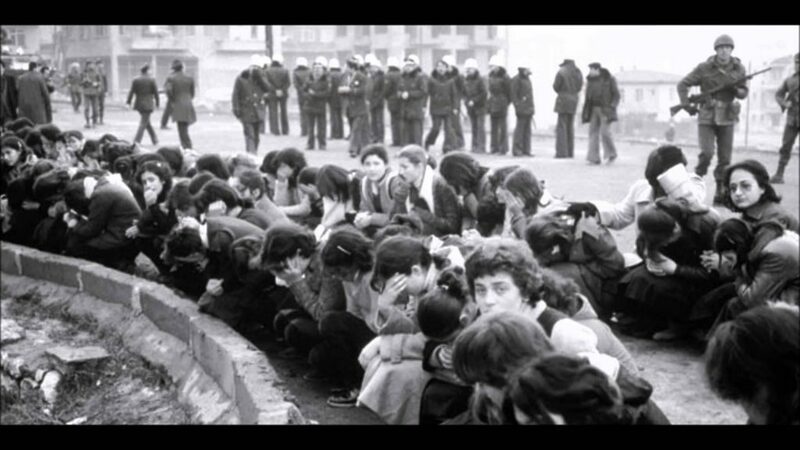 Feature photo: Soldiers round up dissident youth after 1980 military coup in Turkey. Source: Taner Bayram / Onedio. Foti Benlisoy, a member of Başlangıç, is a historian and co-founder of the Greek-Turkish publishing house Istos. He has published books the protests of Greece, Tunisia and Egypt and the Gezi movement – both in Turkish.